With building permit in hand, it's finally time to get my vertical....vertical again! I started out the process by emailing the Building Official for the city with my plans and an outline of what I had planned to install, asking for guidance. Since my antenna is MOSTLY quite small (diameter wise) you could judge that there is no permit required, but with the 40/10m counterpoise loop, it does exceed the diameter rule so the building office required me to get a permit. They also wanted to see that my home owners included liability for the antenna (which most do), but after my $50 fee, I had my green slip in hand. After booking my 811 call - never dig without making sure you'll be away from utility lines - I waited until the authorized work start date rolled around and got to digging. The GAP instructions call for an 18" wide hole, 3 feet deep. I had flashbacks of digging this hole at the place in Wylie and I was nervous about it this go around. The soil here is 99% clay about 8" down so it gets really unpleasant to work in quite quickly. Luckily the ground was relatively dry so it was just a matter of scraping and evacuating the hole repeatedly until I hit the magic number. The instructions from GAP suggested to use a pipe with PVC pipe over it. 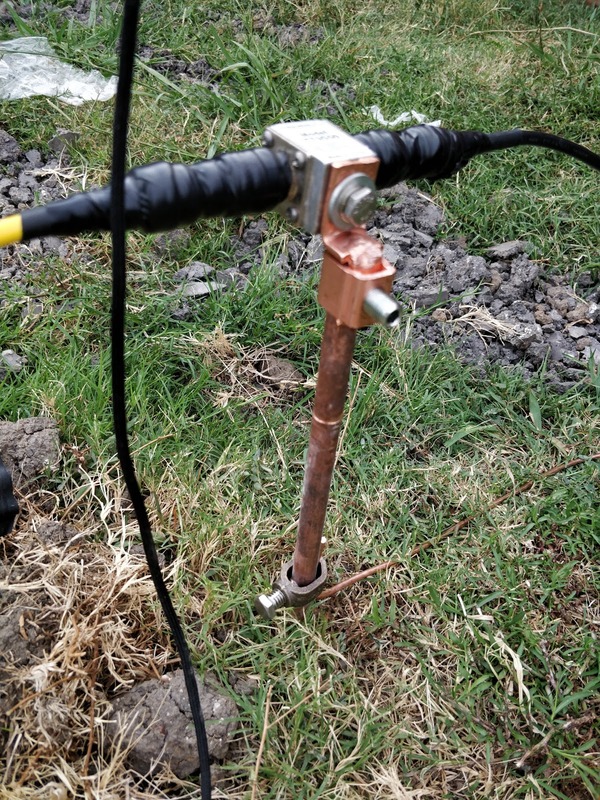 PVC does not bond to concrete so the idea is that you could pull the antenna out of the concrete for maintenance. I did not try to do this at the last house since I didn't spend enough time thinking about how that worked. I could not find any PVC at the normal stores that would fit over any mast material but the instructions did suggest cutting the pipe lengthwise to expand it over the mast. This go around I decided to give it a shot. Using a standard wood handsaw, I cut the slot down the side of the pipe and hammered it onto my mast (sorry no pictures). I then wrapped the PVC in shipping plastic - you know the stretchy stuff they wrap furniture in - and got it situated in the hole. 5 bags of quick set concrete mix and she was set. Then came the time to attempt to pull the mast out... It moved about 2 inches then there was no more movement. I tried everything to get it to pull out of the concrete but it was not going to happen. Its no loss, I just had to mount the antenna the same way I did at the last house: put the bracket near the ground, tilt the base into it and then slide it up the mast to the top. Really not all that difficult having done it several times before. Someday I'll figure out a way to get some more upward force on the mast to free it from the concrete but not this time. I completed the installation by installing the 40/10m "radial" loop and spreader arms. My measurements and planning almost worked the way I wanted. I was far enough from the fence that the hoop didn't hit anything but my mast was just too short to get the hoop above the fence, and more importantly, above head level. I can probably find a way to lash up another mast to get the additional elevation I'm after but this will do for now. Looks a little wonky... guys were too tight! Is it the most elegant solution? No. But it should provide the protection I need. My only hope is that it passes inspection! Be looking for operating reports soon! I'm on the air!